The US-based marine environmentalist group Sea Shepherd Conservation Society has resolved its long-running legal dispute with Japan�s Institute for Cetacean Research (ICR) over whether Sea Shepherd and its affiliated parties were in contempt of a 2012 injunction entered by the Ninth Circuit Court of Appeals. Sea Shepherd will pay ICR USD 2.55 million under the terms of the settlement. In exchange, ICR will dismiss its action for more than USD 4.1 million in damages related to contempt, and drop all claims against the former Sea Shepherd board of directors. "Sea Shepherd does not agree with the Ninth Circuit's holding that it was in contempt, but after more than two years of litigation, we are very pleased to be putting the contempt action behind us,"said Claire Loebs Davis, Sea Shepherd legal counsel and partner at Lane Powell. "By its very nature, the contempt action was a one-sided inquiry. We look forward to focusing on the continuing litigation in the district court, which provides Sea Shepherd with the opportunity to expose ICR's dangerous and illegal activities in the Southern Ocean - including the violent actions taken against those who have tried to stop it from killing whales in violation of international law." ICR first filed suit against Sea Shepherd and founder Paul Watson in 2011 in federal district court in Seattle. In March 2012, District Court Judge Richard Jones denied ICR's motion for a preliminary injunction, but in December 2012, the Ninth Circuit Court of Appeals reversed and entered its own temporary injunction, prohibiting Sea Shepherd, Watson, and any party acting in concert with them from approaching ICR's vessels closer than 500 yards in the Southern Ocean. 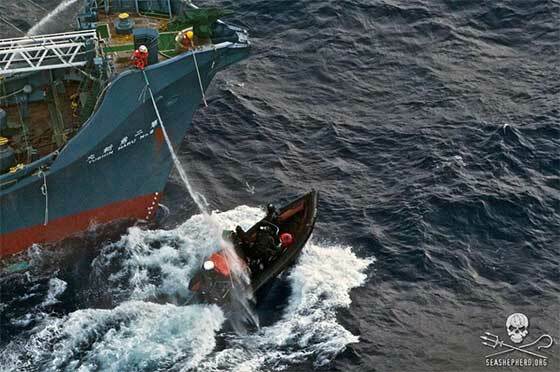 The settlement was reached after the US Supreme Court declined to review the Ninth Circuit Court of Appeals finding that Sea Shepherd had violated the injunction.